Most consumers don’t have access to the tools they need to live healthy financial lives. They grapple with problems such as erratic cash flow, limited savings, and access to responsible credit. Banks and FinTechs typically offer no holistic solutions. We recently interviewed Colin Walsh, CEO and co-founder of Varo, an app that integrates basic banking products with financial health tools. Before starting Varo out of his guest bedroom, Colin spent 25 years working in traditional financial services companies, including Lloyds Banking Group and Wells Fargo. Varo’s mission is to improve the financial life of the customer. They want to merge big bank capacity with startup fintech focus to create a bank that helps people live better. What’s the current landscape of banking and finance? Where does Varo fit into the banking world? Banking as an industry has been around for 2,000 years. All that time, it’s been about trust. People sat in front of their local banker to talk about everything from day-to-day problems to life goals. Over the last few decades, though, banks have grown massive. Their technology is aging, and their cultures are inert. That leaves a lot of space for innovation. Plus, banking is no longer relational. FinTechs are reinventing banking at warp speed, but they are tightly focused. They’re not forming a comprehensive relationship model. Varo’s strategy is the same as the big banks – be the core financial location starting with checking account. But ultimately their goal is to serve those customers who may be hands-off when it comes to managing their daily finances. What is it like to leave a well established industry and start your own bank? “Taking the journey from a big company to working in your guest bedroom is daunting,” Colin said. But everyone knows the existing model is fundamentally broken. That’s why Colin is building a non-traditional banking team. Some have helped lead large financial institutions, but many come from Silicon Valley or from top national brands in other industries. Their common denominator? “These are people who cared deeply about the problem we are starting to solve,” Colin said. What differentiates Varo from other banks or FinTechs? “The intensity with which we listen and develop our product right alongside our customers,” Colin said, “differentiates us.” Varo even developed a team of Millennial advisors to answer the question: What would the bank of the future look like to you? Varo made it happen in three months. Where are you going with this? What’s the overriding vision for Varo? “We don’t see ourselves as having a start and stop point,” Colin said. It’s about continuing to listen to customers and continuing to deliver delightful experiences. Varo wants to keep asking powerful questions: Are we reducing the cost of banking for our customers? How many of our customers are opening savings accounts? Is saving new to them? What do you see as the challenges over the next year or 18 months? Varo is the first FinTech in the United States that has applied to become a full national bank. It was an audacious move for a financial technology company and involved a rigorous process, but according to Colin, it’s going well. Having a lot of people inside the company who understand the complexity of modern banking, including the current intense regulatory environment, is amazing and exciting. This post is based on a podcast interview with Colin Walsh from Varo. 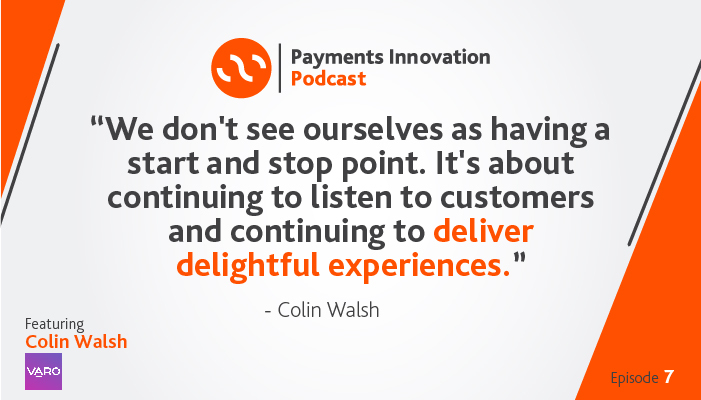 To hear this episode, and many more like it, you can subscribe to Payments Innovation.